Once again, Devontae Cacok claims a school record as his own. Devontae Cacok (15) during UNCW's Thursday night matchup with William & Mary on Jan. 24, 2019. 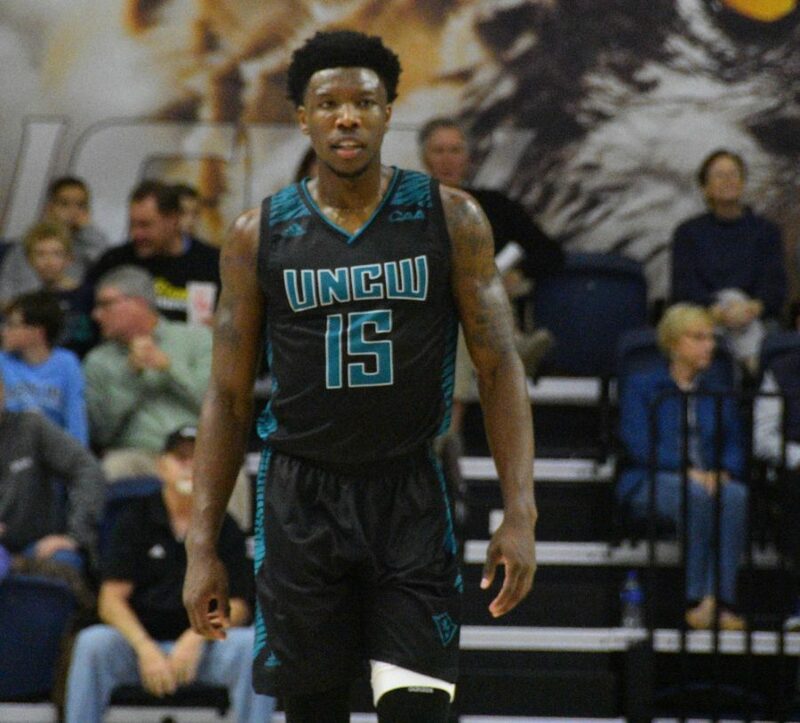 On Nov. 11, 2016 in front of a home crowd, sophomore Devontae Cacok dropped 14 points and 16 rebounds in UNC Wilmington’s season opener against Claflin University. This was the double-double that would spring a chain-reaction, paving the way for the current-senior to cement himself in UNCW basketball history for years to come. Cacok would go on to hit the double-double mark 12 more times during his sophomore season, helping to lead the Seahawks to a Colonial Athletic Association championship and NCAA tournament appearance. In the NCAA tournament, Cacok had 12 points and 15 rebounds against a fifth-seeded and nationally-ranked Virginia team. While the Seahawks would ultimately lose, his show out performance brought the ‘Hawks to within five by game’s end. He would up the ante his junior season, racking up 22 double-doubles including a 20-20 game (26 points, 24 rebounds) against conference-foe James Madison and three games with 20 or more rebounds (24, 21, 21). His junior-year performance also earned him national recognition as the NCAA’s leading rebounder over well-known big men Deandre Ayton (Arizona), Marvin Bagley III (Duke) and Luke Maye (North Carolina). Heading into his final year as a Seahawk, Cacok had accumulated 35 career double-doubles. This meant that 16 were needed to snap the previous record of 50 set by Brian Rowsom in the 1986-87 season. For most players, 16 double-doubles in a season would seem daunting. But Cacok, who hits that mark on average (15.9 ppg, 12.2 rpg), made the trek to 51 seem like a Sunday stroll. On Jan. 26, 2019, UNCW played host to Elon. In front of 4,196 Seahawk faithful, Cacok made history. With 20 points and 19 rebounds, he hit the magic 51, becoming UNCW’s frontrunner for all-time double-doubles. On top of his newly acquired UNCW record, Cacok also broke into the top-3 of CAA career rebounds with 1,125 surpassing Vernon Butler (Navy). He became the leading rebounder in UNCW history earlier this season with 1,056. It took 22 games for Cacok to hit the 16 double-doubles needed to break the record. And with nine games left on the docket, he has the chance to set the bar high for the next player ready to take a swing at the feat. However, that may be a while as no current Seahawks are even close to that number. This season, Cacok leads the NCAA in double-doubles with 16. He is closely followed by South Dakota State’s Mike Daum and Kansas’ Dedric Lawson who have 14 apiece. He currently sits at third in the nation for rebounding.